Seventeen students studying abroad in India didn’t waste any time before immersing themselves in the new culture. They zipped around on auto rickshaws on the first day, learning to negotiate prices with drivers who speak Kannada, the local language. The students’ first day in Bangalore set the tone for the next 10 weeks. They quickly got used to getting out of their comfort zones to problem-solve both everyday hurdles and big issues facing humanity, called grand challenges. Cows freely roaming the streets, spicy food for breakfast, traffic rules that are interpreted as suggestions, brightly painted buildings and cars honking constantly were just a few differences that greeted GCIL students in Bangalore. “A lot of the lifestyle is going with the flow. The better you are able to do that, the easier it is to adjust,” Modabber said. An affluent city in a low-income country, Bangalore was selected to headquarter the GCIL program because organizations there are already addressing big challenges. A partner organization in Bangalore, called ILK, helped recruit local organizations and deliver the GCIL program. GCIL students stayed at the centrally located Indian Social Institute. Each student had their own dorm-style room and bathroom. An on-site canteen provided homemade Indian meals, as well as the occasional fried chicken for the American students. The small campus included classrooms and a small grassy courtyard to relax. During a visit to learn about a school’s water system, CEE senior Mark Galiza interacts with children. During the GCIL program, students learned to become problem-solvers by practicing design thinking, an iterative process that entails listening to people articulate challenges, defining problems, proposing solutions, creating prototypes and testing designs. Class exercises such as designing the ideal wallet for a teammate helped the students learn how to listen with empathy to better understand challenges. To get used to asking uncomfortable questions, GCIL students visited a slum with the organization Sukhibhava, which brings menstrual health education to communities. Assisted by a translator, the students were asked to approach women in the community and ask where they obtain feminine hygiene products. While some women walked away, many were happy to talk. “People were really welcoming and felt comfortable talking about something that seems like it would be very personal and private,” Modabber said. The students also took field trips to learn about pressing issues in society. They toured an organic farm, Annadana Farms, which empowers farmers by providing training and land to grow food. Accompanied by the organization Hasiru Dala, which advocates for sustainable livelihoods for waste workers, the students visited a dry-waste collection center where some of the workers hadn’t been paid in more than six months. Beginning in week four, the students were ready to get to work. Divided into four teams, they partnered with local organizations on specific problems for the remainder of the course. After breakfast each morning, the students departed for their job sites. Each team addressed a different problem: housing construction in slums, water quality and quantity, financial literacy for migrant communities, and secondary education in rural areas. Comprised of students from various disciplines, the teams took advantage of collective strengths and skills. To address water quality and quantity, Galiza’s team investigated the growing reliance of households on borewells, which are narrow wells drilled into the ground. As borewells often run dry from overconsumption, the team identified a lack of knowledge about water quantity and quality. Galiza’s team created a borewell monitoring service called WELLNESS, which collects water quality and quantity data via a smartphone application and automatically uploads it to a centralized database. The team’s approach also provides data analysis and easy access to online information, so residents can monitor their water source. By the end of 10 weeks, each team developed a plausible solution. To share their work, each team gave a public presentation and created a two-minute video. When asked if the program should be offered again, the students were unanimous: “They said yes, yes, yes,” Marshall said. A few modifications are already underway in preparation for next year’s program. In addition to increasing the class size from 17 to 25, more professors will rotate through the 10-week course, each spending a few weeks teaching and advising students. This isn’t the first study abroad program that professor Julian Marshall has founded— but it is the first one at UW. Marshall, who joined the UW CEE faculty two years ago from the University of Minnesota (UMN), modeled the new program after a similar program he co-founded at UMN called the Acara Program. Marshall served as the primary instructor for the UW program, collaborating with UW biology faculty member Moon Draper and several faculty members from across campus, including Karl Böhringer (electrical engineering), Renee Heffron (global health), Debra Hildebrand (business), Tania Isaksen (public health), Melissa Mugambi (global health), Gerald Seidler (physics) and Steve Tanimoto (computer science). 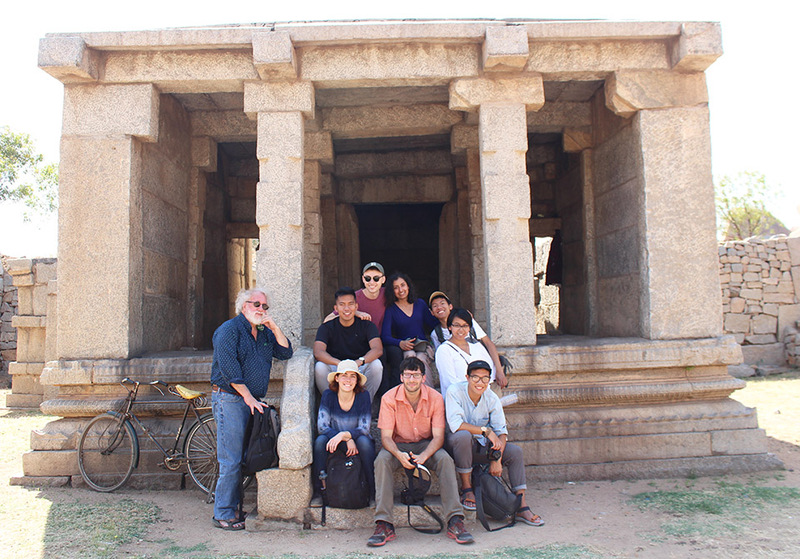 Several organizations and local collaborators in Bangalore also contributed to the class. On evenings and weekends, the students explored the city and surrounding area. Highlights include visiting the city of Mysore to see the royal residence and historical Ambavilas Palace, hiking to Gokarna beach on the west coast of India, and taking a weekend trip to the ancient village Hampi, a UNESCO World Heritage Site. The students also enjoyed local celebrations including the Holi Festival, known as the “festival of colors,” where people throw colored powder on one another to celebrate the victory of good over evil and the arrival of spring.